Like many others, my family celebrated America's birthday with a BANG! Despite rain showers in our area, on the evening of the 4th we watched a dazzling fireworks display. Even though the display wasn't as large and elaborate as some, the kids looked on in wonderment. My daughter still gets anxious about the loud booms but this year we were prepared and supplied her with a set of safety earmuffs borrowed from Grandpa. They worked like a charm. We typically associate fireworks mainly with the 4th of July, however fireworks accompany celebrations year round. In fact, the month of July is filled with fireworks around here as area communities host their own shows at dusk to correspond with community celebrations. Likewise, our favorite children's book containing fireworks isn't necessarily about Independence Day but about a family preparing for and watching a fireworks show. "Oh, I don't think there will be a band," said her mother. "But you can't have fireworks without a band," explained Olivia. 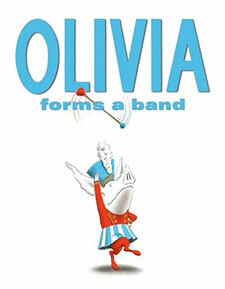 Falconer's Olivia picture books are perennial favorites in our home, but Olivia Forms a Band is a perfect summer read. While Olivia's mother prepares for a picnic and an evening of fireworks, Olivia decides that the fireworks must be accompanied by a band. She scavenges around her home and finds all the necessary parts to create her own loud and noisy one-man (one-pig) band. A typical preschooler, she quickly loses interest in her band and then gets ready for the fireworks show by applying a good deal of red lipstick on her mouth, much to her mother's dismay. After the family arrives at their destination, they dine on a picnic of corn on the cob, strawberries, and watermelon and sandwiches and settle in to watch a beautiful fireworks display. I've read several reviews where Olivia Forms a Band is mentioned as a 4th of July book, but in truth, Independence Day is never mentioned in the text. What the book does bring to mind is all those summer hometown family festivities filled with picnics, parades and fireworks. Yes, many events like that happen to occur on the 4th of July weekend, but not always. I love the feeling of family that this book evokes. Anyone with kids knows about the juggling involved when trying to get a family out of the house to go to an event, and Falconer does an awesome job capturing this struggle by including bathroom breaks and parents lugging an armful of supplies and exhausted children. The image of Olivia's family gathered on a blanket watching the fireworks together at sunset is touching and simply splendid. In this page spread, Falconer cleverly combines his illustrations with an actual photo of fireworks. Those musically inclined will appreciate the page where Olivia imagines herself playing in a marching band because it includes a fold-out musical score. I couldn't find the title of the music mentioned anywhere, but I'm nearly 100% sure it's a version of Sousa's "The Washington Post" march. The kids and I enjoy singing the tune when we read the book together! The Olivia the Pig website includes a fun "Olivia Forms a Band" game where kids can make the Olivia play all the instruments in her one-man band. Lots of bangs, clatters, dings and drumming. For some safe fireworks fun, check out the National Institute of Environmental Health Sciences Fireworks Fun page. Kids can click to create their very own virtual fireworks display. 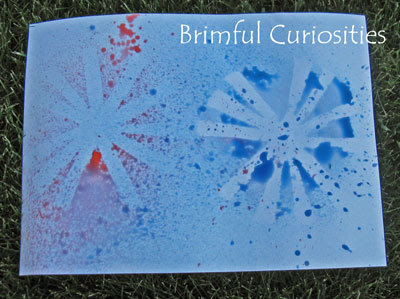 Last weekend we crafted our own quiet but fantastic firework prints using a spray bottle, colored water, watercolor paper, Glue Dots, and a small plastic cup. 1). 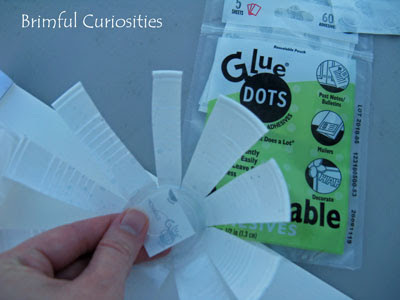 Cut several 1/2" strips all the way around a small plastic cup leaving the center untouched to form a fireworks shape. 2). 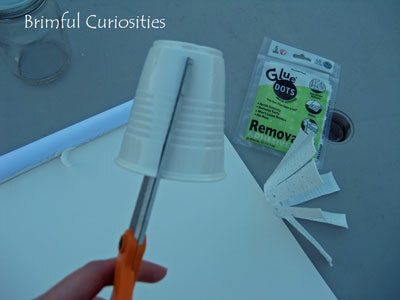 Flatten the cup and apply a Glue Dot to the center of the cut out plastic cup firework. 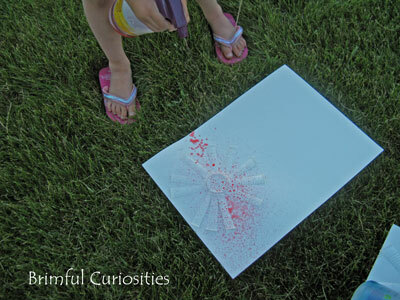 Stick the plastic cup firework to a piece of watercolor paper. 3). Partially fill a couple of spray bottles with water and put several drops of food coloring into each bottle to achieve the desired colors for your project. (We made red and blue fireworks.) Lightly mist the page, spraying over top the plastic firework cup. 4.) Remove the plastic fireworks cup to see the firework print image left behind. Move the plastic fireworks cup to another location on the page and repeat spraying using a different color. I love your spray bottle craft. The book looks fun too. You need to link this post to stART. My middle daughter loved the Olivia series when she was little. Thanks for reminding me about the book series.